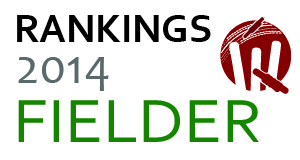 The ODI Wicketkeeper/ Fielder Rankings 2014 is out! 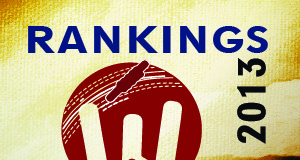 in the Ninth edition of Vineet’s Cricket Rankings (Check out the ODI Wicketkeeper/ Fielder Rankings 2013 here)! A player from a minority team took the first spot for the first time in fielding! Cross (Scotland) took 18 catches in just 7 matches! to take the top spot. Wade (Aus) took 15 catches and 1 stumpings in 7 matches to come next. Saha (India) who replaced Dhoni as India’s keeper for a few matches took the third spot with 11 cattches and 1 stumping in 6 matches. de Kock (SA) took 32 catches and 2 stumpings in 19 matches and came in fourth. Luke Ronchi (NZ) took 22 catches and 1 stumpings in 16 matches to be fifth on the list. 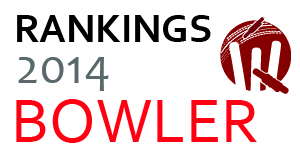 Where are the Top Wicketkeeper/ Fielders of 2013? Kamran Akmal was left out and Sarfaraz made a return! *These rankings are based on Players who’ve played 5 matches or more. These rankings are prepared solely by myself based on owned algorithms.